Stuffed sweet potatoes are a family dinner classic: they’re easy to make, they’re simple to serve, and you can put just about anything in the stuffing. 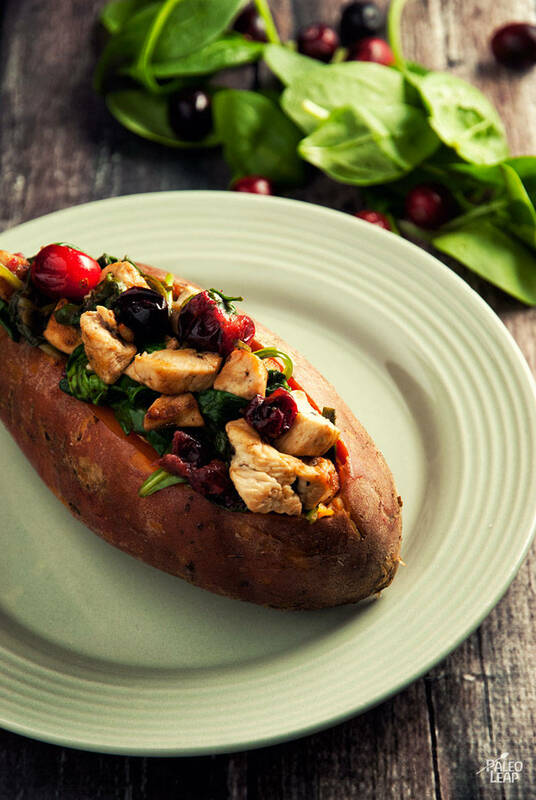 The cranberries here add a nice flavor contrast while the spinach is a great way to sneak some more vegetables into your meal. Put the potatoes in the oven 45 minutes to 1 hour (depending on the size of your potatoes) before you plan to start cooking the chicken; by the time you’re ready to stuff them, they should be done. Seize your opportunity to use up some leftover sweet potatoes that you have from another day. If your potatoes aren’t already warm, don’t worry; the recipe includes directions for warming them up in the oven. Even with the spinach in the stuffing, you’ll still want another vegetable side to make this a real Paleo meal. A quick pan of fried onions would be easy to make, or just toss up a big leafy salad and you’ll be ready to eat in no time. Cook the diced chicken until just cooked through. Add the cranberries to the chicken and cook until soft. Place the 4 sweet potatoes on a baking sheet. Slice them open and divide the filling equally among them. Season each sweet potato to taste and bake just until everything is warm (about 15 minutes).